Is togetherness the latest drug? Will touchy feeliness be the answer to the pharmaceutical industry’s crisis of productivity? Collaboration certainly isn’t anything new in the life sciences, but the nature and structure of partnerships is evolving to the point that many companies are now contemplating pooling their resources…and diluting their returns. Certainly the past decade has been marked by more partnerships between industry and academia, where there has been an effort to find a win-win solution to academia’s funding deficits and pharma’s desire to get more helping hands in early innovation. Out of this have grown “open-source” research efforts that use pharma’s financial backing to create or aggregate data any researcher can use. Sage Bionetworks, a three-year-old Seattle-based non-profit, offers a “commons” of pooled data and resources. Merck has contributed many human and mouse disease models for open consumption. Eli Lilly has opened up its doors to compounds created at academic labs through its PD2 and other Open Innovation Drug Discovery efforts. In 2008, GlaxoSmithKline released over 300 cell lines to the National Cancer Institute’s Cancer Bioinformatics Grid, open for academics to mine. The Structural Genomics Consortium is an open-access database of 3-D protein structures that counts Lilly, GSK, Novartis, Pfizer, and most recently Takeda among its members and financial backers. While these kinds of open efforts come with a series of challenges concerning ownership, consent and disclosure, and many other issues, they exist because industry increasingly recognizes that biology is too complex for any one company, even a large one, to tackle on its own. Major drug companies have also started to innovate the way they work with venture capitalists to help nurture early research. Johnson & Johnson announced back in January that it is partnering with Polaris Venture Partners to scout out and co-invest in biotech startups–presumably structuring deals such that venture backers can find an exit without relying on the lousy IPO market. And they’re hardly alone–as I highlighted a few months ago.. But now drug companies are starting to do the unthinkable–work directly with each other. They’ve taken baby steps in this direction before, often with a focus on emerging markets and diseases not viewed as critical profit-drivers. For example, 13 major drug companies joined the Bill and Melinda Gates Foundation earlier this year to combat tropical diseases. But rather than just contributing medicine, some of the companies– Abbott, Johnson & Johnson and Pfizer–are actually collaborating on research as part of the Drugs for Neglected Diseases Initiative. All the companies are sharing compound libraries. That’s not entirely unprecedented, but companies that have wanted to work closely together in the past have formally launched joint ventures, like the HIV-focused ViiV Healthcare venture between Pfizer and GlaxoSmithKline. Now these cooperative efforts are broadening. One announcement made at the recent Biotechnology Industry Organization (BIO)convention is the formation of a consortium for neuroscience research between seven companies including Biogen, Abbott Labs and Merck. The stakes a fairly small, at least money-wise–each company is only pledging $250,000 at this point. But it is symbolically important that they are sharing all the costs of basic research, as well as their expertise, to try to quickly and efficiently get R&D off the ground. While some of this newfound camaraderie might be difficult for companies dreaming of developing blockbusters and keeping all the profits to themselves, there is a silver lining. The growing demand for drugs in emerging markets means that some of these collaboratively developed drugs may eventually reach much broader audiences–meaning larger populations over which to recoup development costs, bigger opportunities for rare disease indications, and acceptable profits even if prices are forced lower. That should be some consolation. While the US National Institutes of Health Advisory Committee to the Director’s Biomedical Workforce Working Group issued a draft report this month, detailing data it collected as well as its recommendations for the federal agency, Sally Rockey really breaks it down at her NIH Office of Extramural Research blog. “I plan to highlight some of the specific data in future posts, but first, I’d like to discuss the outcome — the conceptual framework that presents a snapshot of the biomedical research workforce, incorporating the latest available data,” she says. And she does, in an infographic that follows the career paths of the 9,000 biomedical PhDs who graduated in the US in 2009. Seventy percent of them went on to do postdoctoral research, Rockey notes. Overall, Rockey says, the non-academic biomedical workforce is huge. “If you’re a graduate student or postdoc looking at these numbers, particularly the proportion of people in industry and government settings, it makes sense to learn as much about these career paths as possible,” she writes at Rock Talk. The US National Institutes of Health Advisory Committee to the Director’s Biomedical Workforce Working Group issued a draft report this week that summarizes data it has collected and includes recommendations “that can inform decisions about training the optimal number of people for the appropriate types of positions that will advance science and promote health,” it reads.In its report, the working group emphasizes the overall purpose of its research efforts and resulting recommendations, namely “to ensure future US competitiveness and innovation in biomedical research” through proper undergraduate, graduate, and postdoctoral training and to “attract and retain the best and most diverse scientists, engineers, and physicians from around the world,” as well as domestically.When it comes to graduate education, the working group suggests that NIH cap the total number of years a grad student can be supported by NIH funds, in order to encourage timely completion of PhD studies.As for graduate career training, the working group says that because around 30 percent of biomedical PhDs work in the biotech and pharmaceutical industries — in both research and non-research positions — “their transition would be more effective if their training was better aligned with the required skill-sets for these careers.” In addition, “institutions also could be encouraged to develop other degree programs — e.g. master’s degrees designed for specific science-oriented career outcomes, such as industry or public policy … as stand-alone programs or provide sound exit pathways for PhD students who do not wish to continue on the research career track,” the group continues.For PhDs who do wish to continue on with a postdoctoral fellowship, the working group suggests that NIH “create a pilot program for institutional postdoctoral offices to compete for funding to experiment in enriching and diversifying postdoctoral training,” and adjust the current stipends for the postdocs it supports to better reflect their years of training.In addition, the group recommends that NIH double the number of Pathway to Independence (K99/R00) awards it issues and shorten the eligibility period for applying to this program from five to three years of postdoc experience to encourage more PhDs to swiftly move into independent research positions. Likewise, the group suggests that NIH also double the number of NIH Director’s Early Independence awards “to facilitate the skip-the-postdoc career path for those who are ready immediately after graduate school.”More generally, the Biomedical Workforce Working Group recommends that institutions receiving NIH funds ramp up their efforts to collect information on career outcomes of the grad students and postdocs supported by federal research grants. So, What Does the Biomedical Research Workforce Look Like? Update 6/27/12: The full report is now posted on the ACD website. As I blogged last week, and most of you have heard by now, a working group of the Advisory Committee to the NIH Director (ACD) that I co-chaired with Shirley Tilghman from Princeton just completed a study of the biomedical research workforce. We reported our findings to the ACD last Thursday (you can find a link to the videocasthere). We gathered a lot of data during this study, which are included in the report (see the ACD site for the executive summary and instructions for obtaining a copy of the full report). The data also are posted on an accompanying website. I plan to highlight some of the specific data in future posts, but first, I’d like to discuss the outcome—the conceptual framework that presents a snapshot of the biomedical research workforce, incorporating the latest available data. The framework of the PhD workforce is presented below, and a companion framework for MDs and MD/PhDs in the biomedical research workforce can be seen in the report and on the website. First, 9,000 biomedical PhDs graduated in the US in 2009 (including basic biomedical and clinical sciences), and 70% of these went on to do postdoctoral research. As we conducted our analysis, it became clear that there are few reliable data on the number of biomedical postdoctoral researchers in the US. We lack solid information on foreign-trained postdoctoral researchers, and many postdoctoral researchers change their title as they proceed through their training, complicating the data collection. That’s why the estimate of postdoctoral researchers ranges from 37,000 to 68,000. Looking at the career paths taken by these US-trained biomedical PhDs, we can see that fewer than half end up in academia, either in research or in teaching, and only 23% of the total are in tenured or tenure-track positions. Many other people are conducting research, however, with 18% in industry and 6% in government. The science related non-research box includes individuals working in industry, government, or other settings who do not conduct research but are part of the scientific enterprise. Many of the career paths represented by this box contribute to the scientific research enterprise and require graduate training in biomedical science. For example, program and review officers at NIH and managers in many biotechnology companies would be included in this group. This is my box too. It’s interesting to note the 18% included in this group is made up of PhDs employed in industry (13% of the total workforce), in government (2.5%), and in other settings (2.5%). This means that all individuals working in industry (research plus non-research occupations) represent about 30% of the workforce, and all those working in government represent about 9% (more than 10,000 individuals). That leaves 13% in non-science related occupations and 2% unemployed (this does not include retirees or those who choose not to work). These are 2008 data, the latest available from the NSF Survey of Doctoral Recipients. If you’re a graduate student or postdoc looking at these numbers, particularly the proportion of people in industry and government settings, it makes sense to learn as much about these career paths as possible. I’m very proud that we were able to develop this framework, as it seems that for the first time we have an idea of where domestically trained biomedical researchers are going. I was quite surprised by the idea that the majority of our trainees do not end up in academia. Did this surprise you? The main sources of the original data, from which the graphs in the report were made and these numbers were derived, come from three NSF surveys: the Survey of Graduate Students and Postdoctorates, the Survey of Earned Doctorates, and the Survey of Doctorate Recipients. You can see the specific sources of each number by clicking on the relevant box on the website. The color of the numbers reflects our confidence in the accuracy of the data: high (green), medium (yellow), or low (red). For more details see colors. In this case, the red numbers in the post-training workforce box are accurate, but the color reflects the fact that we know almost nothing about the distribution of foreign-trained PhDs in the workforce, so the overall picture is an under-estimate. The post-training workforce boxes are color coded, with light blue denoting those in research positions and academic teaching positions. The science related non-research box is colored dark blue to indicate that many of the careers represented in this box are closely related to the conduct of biomedical research. Live Chat: Are We Training Too Many Scientists? Too many graduate students and postdocs chasing too few academic jobs has led to a dysfunctional biomedical research system. That’s the conclusion of a draft report on the biomedical workforce released this month by an advisory panel to the National Institutes of Health (NIH). The panel urged taking steps to shorten young scientists’ career paths, including capping how long graduate students can receive NIH support and better preparing them for non-academic careers. The report also encourages university labs to rely more on staff scientists rather than trainees. But is it a good idea to tinker with the research system at a time when NIH funding is tighter than ever? And given that most biomedical Ph.D.s will find a job, are there really too many? The changes may appear to make research labs less productive, but in the long run will result in “a more vibrant workforce,” said Shirley Tilghman, president of Princeton University and co-chair of the panel that delivered the draft report. To address the problem, NIH needs to make some changes, the panel says. The agency should provide supplements to training grants that help students prepare for alternatives to academic careers, such as a master’s degree geared toward an industry position. It should cap how long a graduate student can receive NIH funding at 6 years (the average length of a biomedical Ph.D. including all funding is now 6.5 years, says Rockey). NIH should find ways to shift the funding source for graduate students, most of whom are now paid out of investigators’ grants, to training grants and fellowships. The reason: such programs provide higher quality training, and their graduates tend to be more successful than those funded from grants. Postdoctoral researchers should also be supported to a greater extent by fellowships and training grants, the panel says. And postdoc stipends should be increased—starting with the entry level, now $39,264, which should rise to $42,000—and they should receive better benefits. “We think it is scandalous how [little] postdoctoral fellows are paid,” Tilghman said. Although the panel did not say the overall number of trainees should decline, the recommendations, if adopted, should make the growth in the number of trainees at least slow down because “we’re making it more expensive to have those individuals,” Tilghman said. The recommendations drew concern from at least one ACD member. Biologist Robert Horvitz, of the Massachusetts Institute of Technology in Cambridge, questioned whether NIH should make “risky” changes to the system at a time when NIH is struggling with flat budgets and record-low success rates. “Some of this makes me very nervous,” he said. But Tilghman, who headed a National Research Council panel 14 years ago that she said came to “identical conclusions,” disagreed. “The only time it’s possible to make hard decisions … is actually during tough times,” she said. When molecular biologist and Princeton University President Shirley M. Tilghman first sounded the alarm about the need for major overhauls to the way the United States trains its biomedical workforce in the 1998 National Academies of Science report Trends in the Early Careers of Life Scientists, many of her proposals fell on deaf ears. Fourteen years later, Tilghman is arguing again for training reform, this time as chair of the National Institutes of Health (NIH) Biomedical Research Workforce Working Group. Last week, Tilghman presented a draft of her group’s latest report to NIH’s Advisory Committee to the Director (ACD) at NIH headquarters in Bethesda, Maryland. In the report, the group calls on NIH to divert funding from research grants to training grants for graduate students, support more postdocs on training grants, increase pay and improve benefits for postdocs, and boost the prestige and remuneration of staff scientist positions in academic labs. At the presentation, Tilghman and the other members of the working group argued that in its present state, the graduate training system at our nation’s universities and the workforce that graduates enter into are dysfunctional and unsustainable. At the root of that dysfunction, Tilghman said, is a mismatch between the training most graduate students receive and the careers most Ph.D. graduates end up in. The number of academic jobs has shrunk dramatically compared to the number of new graduates. NIH estimates that 26% of biomedical Ph.D. recipients end up in tenure-track academic positions, down from 34% in 1993; meanwhile, the proportion of nontenure-track academic positions has remained constant. 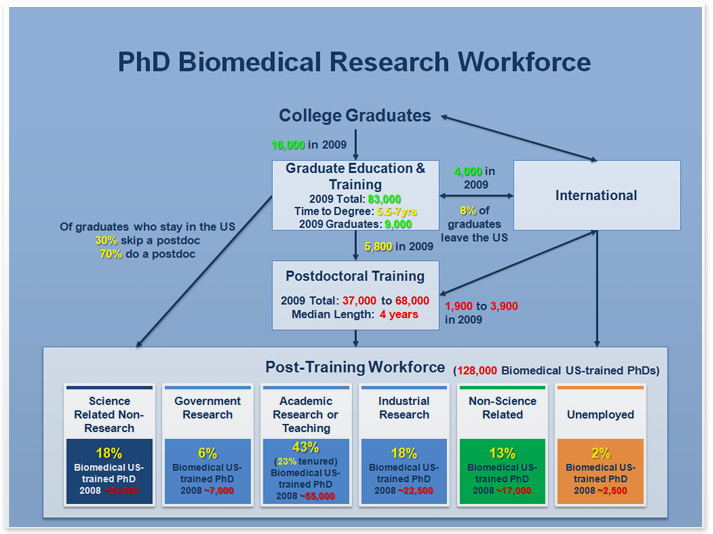 The growth in jobs for Ph.D. biomedical scientists, the working group concluded, is outside academia, so new graduates must be prepared to work in other roles: in industry, in government, or in positions tangentially related to their degrees, such as science writing or policy, Tilghman said. How can universities prepare graduate students better for the careers they’re most likely to wind up in? One way, Tilghman said, would be for NIH to shift funding from R01 research grants, which currently support the majority of graduate students in biomedical sciences, to NIH training grants, which are peer-reviewed by NIH for their training-related virtues. The total number of graduate students supported by NIH, the report says, should remain constant. While the number of graduate students supported by research grants has been higher than the number supported on training grants since the early 1980s, the gap steadily widened as NIH’s research budget grew—then shot up in the early 2000s when NIH’s budget doubled over 5 years (see graph below). Research grants are far and away the most common source of funding for graduate students today. Click here to enlarge image. The report’s authors argue that many graduate students are ill-served by this approach because it limits the ability of NIH to hold principal investigators (PIs) accountable in their roles as mentors. Without oversight, Tilghman argued, it’s easy for PIs to see and treat their graduate students as laborers rather than scientists in training. If a larger proportion of the graduate student population were supported on training grants, she said, NIH could better monitor students’ training and ensure broader exposure to careers outside of academia—and better training in the skills needed to perform well in those careers. Some members of the ACD weren’t buying it. Biologist Robert Horvitz of the Massachusetts Institute of Technology in Cambridge argued that shifting funding away from R01s takes away too much autonomy from PIs. “One wants to be sure that the principal investigators, who are supposed to be doing the research, continue to have enough flexibility to be able to support the research they want to do,” he said. Taking away that flexibility, he argued, could reduce research productivity. Other ACD members, including Haile Debas, director of the University of California Global Health Institute in San Francisco, were more supportive of the recommendations. While such a shift would be bold, Debas said, “you can also do harm by doing nothing.” He proposed that NIH launch experiments to determine whether graduate students who get industry experience during their traineeships, for example, go on to have successful careers in industry. Judith Bond, incoming president of the Federation of American Societies for Experimental Biology (FASEB) and a biochemist at Pennsylvania State University, Hershey, also disagrees with this recommendation, saying in an interview with Science Careers that “oversight of student training should be left to the universities, not the federal government.” Bond is not a member of the ACD. The situation is equally grim, if not grimmer, for postdoctoral researchers, Tilghman and her colleagues argue in the report. The report recommends that more postdocs be supported by training grants and fewer by PIs’ research grants, with the total number of NIH-supported postdocs remaining constant or perhaps decreasing. One way of reducing the number of postdocs—and decreasing the intense competition for jobs—would be to increase postdoc salaries from $39,264 to $42,000 and provide benefits equal to those of employees at their institutions, the report says. It also recommends that NIH mandate a 4% raise before the third year of postdoctoral work and a 6% raise before the seventh. The idea, Tilghman said, would be to motivate PIs to help their postdocs move as quickly as possible into jobs rather than toil away as a postdoc. “One of the things the committee really grappled with is: To what degree are these [people] trainees … and to what extent are they worker bees who are the producers of the research in our lab?” Tilghman said. The working group felt strongly, she said, that emphasizing training is the best way to produce well-trained future PIs. Bond, too, agreed with the postdoc salary recommendation. “In general, FASEB is in favor of increasing postdoc salaries. … Postdocs are essential to work in the lab, and they should be paid a living wage,” she said. But ACD member Horvitz was skeptical. The money to raise postdoc salaries “has to come from somewhere,” he said, and given NIH’s current budget woes, it might be impractical to raise postdoc pay. If PIs were forced to make do with fewer (but better paid) postdocs, he argued, lab productivity would probably decline. One way to provide more job opportunities for Ph.D. scientists would be to increase the number and stature of staff scientists in university labs. (See “A Hidden Academic Workforce.”) One way this could be accomplished would be to have universities shoulder a larger percentage of researcher salaries than most currently do, Tilghman said. That would make the positions more stable and less vulnerable to changes in NIH budgets and competitive grant renewals. Those salaries should also be increased, the report argues, to be commensurate with the training levels of staff scientists and their value to the lab. If the number of postdocs drops as a result of raising postdoc salaries, staff scientists could fill the gap, which should help attract talented scientists to these positions. Finally, Tilghman recommended that NIH award grants preferentially to PIs who employ staff scientists. “When I think about the tradeoff of a graduate student for a staff scientist who is already extremely well trained, who can work without constant supervision, who can really help train the younger people in the laboratory, … I actually think we’ll be more productive,” she said. The staff scientist role is not just a boon for universities. It is also a career destination for some of the tens of thousands of highly trained researchers who wish to remain in or close to academic research—a cadre that’s far too large for the number of available faculty positions. On university campuses, students, postdocs, and professors are so ubiquitous that it would be easy not to notice the other Ph.D.-level professional scientists—often dubbed staff scientists—who roam the halls. Some of them work as lab managers or project directors; others direct or help operate university core facilities. Despite their low profile, staff scientists are numerous and make a major contribution to their institutions. At the University of Wisconsin (UW), Madison, between 700 and 800 members of the academic staff are Ph.D.-level scientists, estimates Heather Daniels, chair of the university’s Academic Staff Executive Committee. For comparison, the university has 2137 faculty members in all disciplines, with a number of staff scientists comparable to the number of science faculty members. The same may well be true at other, similar universities. Many staff scientists write grants. In fact, UW Madison staff scientists brought in $120 million to the university last year, out of a total grant portfolio worth just over $1 billion. When you include grants on which staff scientists serve as co–principal investigators (co-PIs), that figure rises to $240 million. Such positions typically pay better than postdocs and sometimes about as well as assistant professor positions. At UW Madison, the minimum starting salary for an academic staff scientist is $40,055. Unfortunately, there is no mechanism for annual merit-based increases, so staff scientists typically receive raises only when the state pay plan calls for an across-the-board increase. As a result, “the longer you’re here, the more your salary tends to fall behind,” Daniels says. On the positive side, the role of staff scientist has several benefits. Staff scientists typically travel less, work fewer nights and weekends, spend less time writing grants, and have fewer administrative responsibilities than faculty members. They seldom have formal teaching responsibilities, which some staff scientists consider a perk. Much more than postdocs, staff scientists tend to have a hand in more than one scientific project at a time. Here, we profile a sampling of staff scientists from two universities—UW Madison and UCSF—who have foregone the tenure track while remaining deeply rooted in university life. Hi. Would you mind reformatting this blog? I’d like to read your views, but the right side of your text is cut off.